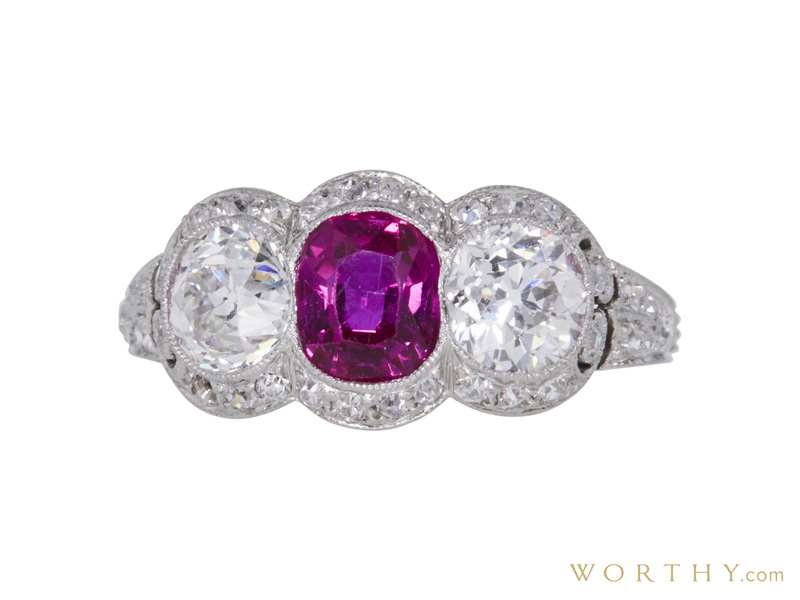 14k gold custom made 3 stone ring consisting of cushion shape, natural ruby, weighing 0.95 - 1.0 carats, having a Red color and Moderately Included clarity, according to GIA grading scale. The center stone measuring 6.15mm x 5.15mm x 3.40mm and carries a IGI grading report. All surrounding diamonds are genuine with a total carat weight (cttw) of 1.77 carats. Antique Edwardian Ring- approx 100yrs old This item was graded at IGI and results are reflected in the IGI report PDF seen in the item images. Carat weights are estimated by formula. Heat Treatment Present in Ruby.